ROANOKE, Va. (KGO) -- The father of slain TV reporter Alison Parker says he will make it his mission to try to change gun laws. Andy Parker said outside of WDBJ-TV on Friday that he supports stronger gun laws and says people at gun shows should have to a background check before they can make purchases. He says he has talked with Gov. Terry McAuliffe about gun laws, but was disappointed that he hadn't heard from Sens. Tim Kaine and Mark Warner. He says politicians need to stand up to the NRA and that his daughter's murder will not be in vain. Alison Parker and cameraman Adam Ward were gunned down by a former colleague on Wednesday. When the survivor of the on-air TV shooting awoke from surgery Thursday, her first communication with her family was concern for the families of the two slain journalists. That's according to Vicki Gardner's boss, Troy Keaton. He said Friday that Gardner expressed condolences to the families of WDBJ-TV reporter Alison Parker and cameraman Adam Ward. They were killed by a former employee of the station Wednesday as they interviewed Gardner, executive director of the Smith Mountain Lake Regional Chamber of Commerce. Chamber Chairman Troy Keaton says Gardner continues to improve. Gardner lost a kidney and part off her colon from being shot in the back by Vester Flanagan. Flanagan later took his own life. Authorities say they have no indication that anyone was helped the former reporter who killed two ex-colleagues on live TV earlier this week. Lt. Phillip Young, spokesman for the Franklin County sheriff, said Friday that they have no indication that anyone was helping Vester Flanagan, but they are continuing to investigate until they can conclusively rule out that possibility. Citing the ongoing investigation, he declined to answer specific questions about the evidence in the case. "We still have to keep as much as we can as close as we can," he said. Flanagan killed TV reporter Alison Parker and cameraman Adam Ward on Wednesday morning. He died later of a self-inflicted gunshot wound. Gov. Terry McAuliffe says he has visited WDBJ-TV to lend his support and give condolences to the employees there. McAuliffe visited Friday and spoke to the media outside of the station. He talked about his support for universal background checks for gun purchases and said "there are too many guns in America." But McAuliffe, himself a gun owner, also says the gunman who killed to TV station employees had passed a background check. McAuliffe said he had spoken to the father of slain TV reporter Alison Parker and he also wants to help advocate for better background checks. Virginia Gov. Terry McAuliffe has arrived at WDBJ-TV studios in Roanoke to talk to the staff in private after two journalists were killed on air by a former co-worker. The Friday visit comes two days after the attack during a live broadcast. Reporter Alison Parker and cameraman Adam Ward were killed. McAuliffe spokesman Brian Coy the governor will "visit with staff and share condolences. " Station general manager Jeffrey Marks says he plans to ask the governor about mental health issues. He was not specific about what questions or remarks he might pose to McAuliffe. The visit and talks are not open to other news media outlets and will not be broadcast on WDBJ. The station has been airing news and reaction about the attack since it occurred two days ago. Several hours after the attack, gunman Vester Lee Flanagan II died of a self-inflicted gunshot wound. The shopping plaza where two journalists were killed during an on-air interview is reopening, two days after the attack. On Friday morning at Bridgewater Plaza in Moneta, Virginia, Gifts Ahoy opened its doors. Manager Lesley Kocsis and another employee unloaded handbags and put merchandise on shelves. Kocsis says: "It's very bittersweet, but we are glad to be back." Kocsis says she saw the shooting on live TV Wednesday, about an hour before she normally comes in to work. She told employees to sit tight and not come in and then stayed home herself, close to the TV to follow the news. She says: "It's cliche, but things like that don't happen here." She also it will take time to for the community to process what happened, but they will bolster one another. A coffee shop at the plaza where two journalists were killed during a live broadcast has become the shopping center's first business to reopen its doors after the attack. Mikey Monaghan and her husband, Patrick, say they had reservations about going to CJ's Coffee and Sandwich Shop on Friday morning because they wanted to be respectful. But then they decided that the community and its businesses needed support. Mikey Monaghan stopped and put her hand over her mouth when she saw a memorial of flowers to the two victims. WDBJ-TV reporter Alison Parker and cameraman Adam Ward were killed Wednesday during an interview at the shopping center, Bridgewater Plaza on Smith Mountain Lake in Moneta, Virginia. Mikey Monaghan says she and her husband arrived at their vacation home in nearby Huddleston on Thursday. She says the killings in the normally quiet area around the lake shocked them. She says: "It's hard to stomach what's happening across the nation. People are using guns to take matters into their own hands." The shopping center where two journalists were killed during an on-air broadcast has opened again, with just a few people arriving Friday morning. Real estate agent Kay DeGiorgi stopped in front of a memorial to victims Alison Parker and Adam Ward. DeGiorgi put down her purse and stood there for several minutes, silently crying and dabbing her eyes. DeGiorgi's office is right next to the site of the shooting. She says she's been in the area for 10 years and calls it "the safest place I've ever lived." She called the third victim, local Chamber of Commerce official Vicki Gardner, the face of Smith Mountain Lake. The shopping center is right on the lake, and DiGiorgi noted that Gardner, who was shot in the back and is in good condition at a hospital, works right nearby. DiGiorgi says: "Keeping Vicki in our thoughts and prayers is going to help heal the community." The Virginia shopping center where two journalists were slain during a live interview is set to open for the first time since the attack. On Friday morning, coffee shop owner Chris Genna walked past a memorial to the victims, with flowers and large portraits. He carried several brown bags of supplies as he unlocked the door to his shop, CJ's Coffee and Sandwich Shop, at Bridgewater Plaza in Moneta. His business was scheduled to open at 8 a.m. That was expected to be the first to opening at the shopping center Friday morning. On Thursday, the owner of the plaza said the shopping center would be open overall, but it would be up to each individual business owner whether to open shop doors. Genna called it an emotional day, his voice faltering. He said: "My thoughts go out to the families." The husband of the surviving victim in the on-air attack of two journalists in Virginia says his wife was shot in the back. Vicki Gardner's husband, Tim Gardner, spoke to ABC News on Friday morning, two days after the shooting in Moneta, Virginia. Tim Gardner says the gunman fired at his wife after shooting WDBJ-TV reporter Alison Parker and cameraman Adam Ward. Tim Gardner says the gunman missed his wife twice, and she then dove to the ground, curled up in a ball, and was shot in the back. He says that after the attack, Vicki Gardner got up and walked to the ambulance after being shot, and she didn't know the extent of her injuries at that point. He adds: "But the surgeon told me that a couple of centimeters and she wouldn't be walking, and a couple of centimeters more and she wouldn't be alive." Journalists across the country have joined in tributes on social media websites to WDBJ-TV reporter Alison Parker and cameraman Adam Ward. Broadcasters from Boston to San Diego are posting photos of themselves or their staffs with the hashtag #WeStandWithWDBJ on Facebook and Twitter. Some are wearing ribbons in the selfies. Others offer condolences and indicate their solidarity with the Roanoke, Virginia, TV station. Parker and Ward were shot and killed on live television during an interview Wednesday morning. The gunman, 41-year-old Vester Flanagan, died hours later of a self-inflicted gunshot wound. 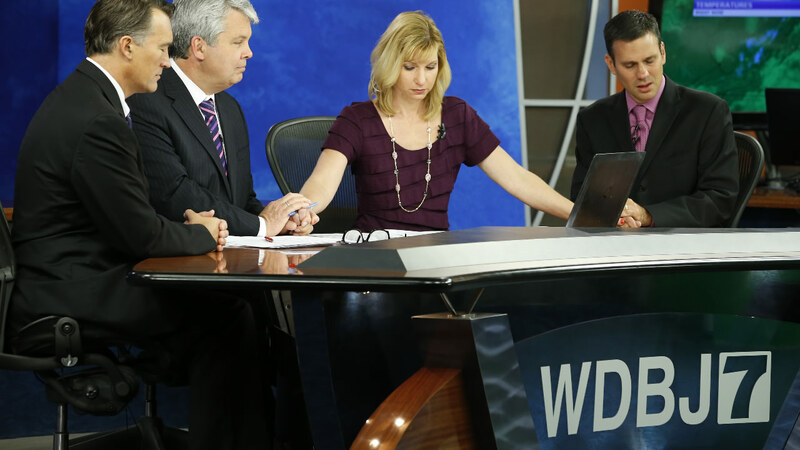 Hearts remain heavy for the morning news team at WDBJ-TV two days after two station employees were shot to death on the air. Morning anchor Kim McBroom started Friday's broadcast by telling viewers, "another tough morning for us, but we're soldiering on." Tributes to reporter Alison Parker and cameraman Adam Ward continued to dominate the 5 a.m. newscast. This time, news unrelated to the tragedy dotted the program. Parker and Ward were fatally shot by a former co-worker while conducting a live interview at Smith Mountain Lake. McBroom says Ward was a contributor to the station's Friday night high school football coverage. The high school season starts Friday night. Businesses are reopening in Virginia at the scene of this week's on-air shooting as more details surface of the gunman's long history of confronting and bullying co-workers at a succession of television and customer-service jobs. Friday's reopening of Bridgewater Plaza comes two days after 41-year-old Vester Flanagan killed two journalists from a Roanoke TV station where he once worked, and wounded the Smith Mountain Lake Regional Chamber of Commerce official they were interviewing. Flanagan's hair-trigger temper became evident at least 15 years ago at WTWC-TV in Tallahassee, Florida, said Don Shafer, who hired him there in 1999. Shafer recalled Flanagan as a good reporter and a "clever, funny guy" - but said he also had conflicts with co-workers "to the point where he was threatening people." Click here for full coverage on the Virginia TV news crews shooting.